The key is to inject into the overall plan a series of miniprojectsâ€”what we call rapid-results initiativesâ€”each staffed with a team responsible for a version of the hoped-for overall result in miniature and each designed to deliver its result quickly. An excellent article about the use of very short iterations to build a website. The Freedom of Fast Iterations: How Netflix Designs a Winning Web Site. In Scrum, there is some confusion around the various types of estimation that are done. Product Backlog Items are estimated and Sprint Backlog Tasks are also estimated. These two estimates, despite some similarities, are used for very different purposes. Most courses are in the Toronto area, but some are scheduled for Edmonton, Calgary, Halifax, Vancouver and Ottawa. Given the huge interest in the article by Dmitri Zimine about context switching, and despite a couple of good articles about how to determine iteration length, there has been no empirical method described, only reasoning processes. This article describes a simple method to quickly determine iteration length by experimental means. The Art of Obstacle Removal is an important thing for the Process Facilitator to get good at. I was working with a client today and realized that there are really three broad categories of obstacles and only one category is easy to see. The other two are much harder for people to identify and deal with. It doesn’t make sense to separate the thinking from the doing. So the real question is: why do we do this so often? Ryan Cooper has written an excellent article called Trust vs. Camaraderie where he points out that many “teams” have established a feeling of Camaraderie, but not established trust… and that this is a problem. Ken Schwaber has a great talk about quality which supports and confirms my earlier article called Quality is Not Negotiable. Dmitri is only looking at one side of the cost/benefit equation. He’s laid out a very convincing argument why Sarah should not interrupt her carefully planned two week iteration, but he hasn’t even mentioned arguments for the other side: the important sale that will be lost. I have now trained over one hundred people in my Agile Project Managmenet / ScrumMaster Certification course. I’m starting to see and hear some of the results of this training. There are a couple specific “smells” that I have become aware of. One problem with having multiple teams working on the same project will be the tendency to compare the teams’ performance. Why is this a problem? The blog Stronger Teams by Blaine Collins has some incredible stuff on it. 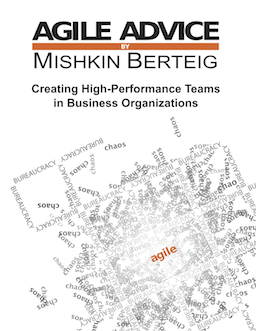 I’ve read quite a few of the entries and they all show the importance and relevance of teams and teamwork to Agile Work methods. Considering some of my recent comments, thinking and coaching experiences, I love the current top article: Treat team members as ends and not means. This correlates strongly to what I consider a distinguishing feature of agile methods: meta-learning done by the team, and it also works well with the Agile Axioms. > I need you guys to find out if we can add “ezhibal” functionality to our old “Tounaf” project, and how much time this fix is going to take. We have a hot deal with an important customer who is almost ready to buy. > Sarah please investigate ASAP. We can arrange a phone call to clarify requirements. It can. We development managers learned it the hard way. We know how programmers think. We know how expensive switching their context is. If Sarah spends just two hours thinking of her old project, she loses a day of productive work on the new one. One day is 10% of a carefully planned iteration wasted if she spends 2 hours sidetracked. In the wild nature of software development shops, however, it never takes 2 hours. 2 hours is the time Sarah is on the phone trying to clarify the problem. 2 hours is the time she is waiting for this phone call, reluctant to get into anything serious. 2 hours is the time Sarah is tweaking her development environment to build her old project. 2 hours is the time Sarah is spending to see if she can come up with a very restricted workaround. 2 hours is the time Sarah is on another phone call, explaining the potential workaround. Not enough time for real solution, no time spent on actually resolving the problem. 10 hours of unplanned and unproductive time is spread out over 3 days. 30% of iteration wasted. At this point the planning goes down the toilet. The iteration is dead. The new project is slipping late. The rush around the old project yields little results either: with no time for a real solution the best bet there is a quick and dirty fix. But the harm goes further. Sarah was eager to spend time on programming – she wasted it. She is robbed of her professional satisfaction, the good feeling of achieving the iteration goal and releasing project on time. On the next iteration planning session Sarah can’t help thinking “Why kill time if we don’t stick to the plan anyways?” The team gets the message: “We are NOT seriously doing iterative development. We are going ad-hoc”. 1) Put the issue to the back log and plan it for the next iteration. 2) Cancel the iteration, suspend the “new project”, replan and work on the issue. Let them make their call. This is the tough part; it is never well received. But I have to take a stand. I don’t have the luxury not to do this. The iterative development is an act of fine balance between adopting the continuous change and securing some stability for the developers to perform. We as development managers are responsible for keeping this fine balance. We do it for our team. We do it for our project. And we do it for our fellow project managers. It’s great to have all the visitors here from Reddit and Joel on Software – thanks!. Joel brings up a great question about the other side of this: what about the sales guy who wants the new feature? What is the difference between an agile process and a non-agile process? More and more, organizations are applying agile methods to large projects or efforts that require more than a single team. There are three dimensions or concerns of coordination. It is critical that all three be addressed, but there are many ways of addressing them. Here I will simply list these three types of coordination and make some simple suggestions of how to implement them.